When a nine-year-old from her neighborhood was killed by a speeding car, Hilda Cohen, who studied urban design at the UO, joined with fellow Brooklyn parents to start Make Brooklyn Safer, an organization that champions street safety by promoting secure places to take kids biking and telling police about problem intersections. “The core people in the group had a personal connection to the boy. When the child was killed, we decided, let’s put together all these resources,” says Cohen, who had been working for street safety prior to the child’s death. 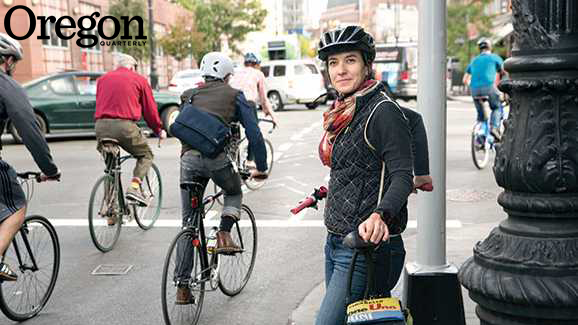 While used to thinking of herself as simply the concerned mom who rides her bike everywhere, Cohen now sees that there are inroads for making change. She has become an advocate for more equitable use of public space. Cohen believes that safer streets can be an economic boon for communities, with families much more likely to visit businesses—and spend money—if they believe that it is safe to do so.